Even celebrities agree that this color is ready to take over. Cheat glossy lids with light coral eye shadow with a subtle hint of shimmer. Dab some on your lids using your finger for fuller pigment! A bold wash of color on your lids is both a statement and an effortless way to rock the shade. Try an all-matte look like Anne's for a budgeproof beat. On the go? Cop Martine's go-to makeup trick: a full face using one lipstick! Use a creamy matte bullet that'll allow you to blend the color seamlessly on your eyes and cheeks. Coral lips are typically reserved for summer, but since it's officially the color of the year, feel free to rock that pout all year round. For a juicy pout that doesn't bleed, make your first layer a matte liquid lipstick that won't feather outside your lip line. Wait for it to dry down fully before applying a generous helping of gloss! Smudged lips are high on our trend radar, too, and the procedure here is simple—swipe on as much lipstick as you want and use your finger to smudge it out. Don't stop until you get rid of the harsh lines! Sunset eyes are the new alternative to a black smolder. The key here is to build the colors slowly, going from light browns and peaches to their darker counterparts. If coral is usually not part of your routine, wearing it as a blush is one way to tell if it's for you. 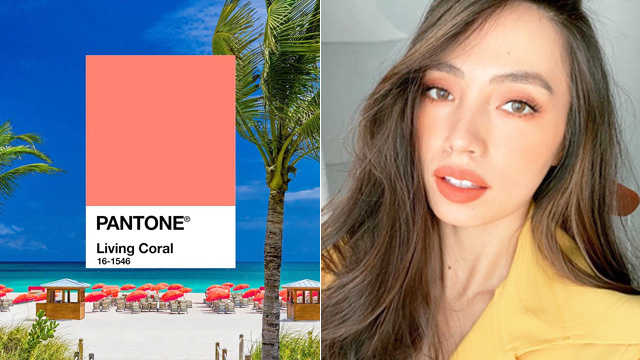 Mixing and matching your coral makeup with complementary hues like soft pinks allows you to wear the color without going full-on fruity. Shades of brown, blue, and beige work well with it, too!